I first want to thank Cathy Andronicou for letting us know about this challenge involving Penny Black goodies. She is so great at keeping us updated at the Penny Circle Flickr group. Stamped Penny Black Squeeze til I Squeek with Momento Tuxedo Black and colored with Copic Sketch markers. 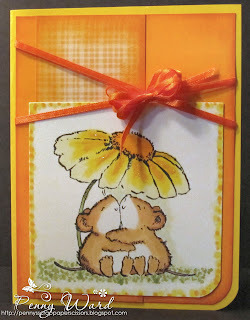 Doodled the grass and around the edge of the card as well as the the center of the flower to give it dimension. Used a scrap of patterned paper, distressed the edges and used Tim Holtz ink on this piece as well as the second layer of the card. Added orange ribbon and slid top layer of card underneath ribbon.